I rolled black ink in a thin layer, completely covering the gelatin plate. I placed the objects (weeds, feather, leaf) facedown on the plate. Covering the plate with a piece of newspaper, I pressed the paper to remove most of the ink from the areas it touches. Removing the newspaper, I gently lifted the objects from the plate. The areas where the objects were placed retained the ink, which contains very detailed impressions of the objects. I placed a piece of print-making paper face-down on the plate, then applied gentle pressure to the back of the paper, causing the image to be transferred to it. No press is involved. This print was created using the same sequence of steps as in the previous print. In the feather image, you can see the level of detail which can be captured. I rolled orange ink thickly on a piece of Plexiglas. I placed a gelatin plate facedown on the Plexiglas, then carefully pried it away, allowing the ink to be transferred to the gelatin plate. When it was transferred, because the ink is fairly viscous, it created a ridged/webby texture on the gelatin plate. Then I printed the gelatin plate on a piece of print-making paper the same way as in the previous prints. Then I repeated the same steps using white ink on the Plexiglas. You can see the interesting texture that resulted. I used the Plexiglas technique described above to create the orange ridged texture, which is visible in the center "flame" part of the print. 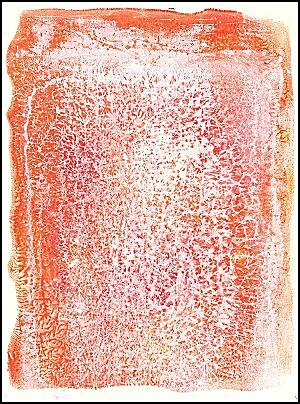 This formed the first impression on the print-making paper. 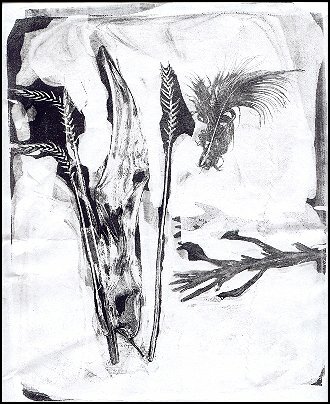 Then, I taped a piece of paper in the shape of the "flame" on the print-making paper to serve as a mask. I then inked a gelatin plate with a layer of violet ink, and printed it as the second impression on the print-making paper. Then, I trimmed the piece of paper serving as the "flame" mask to be smaller, then printed the gelatin plate again as the third impression on the print-making paper. I did not re-ink the gelatin plate, a thin layer of violet ink remained for the previous step. This is referred to as a "ghost" print. 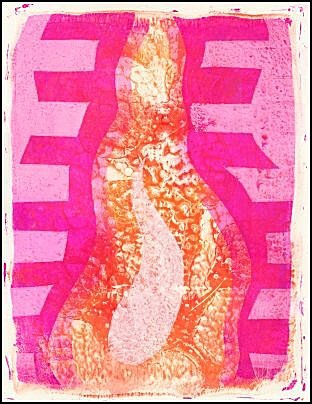 Then, I trimmed a piece of paper to serve as a mask for the "striped shape", then printed a layer of white ink outside the "flame" shape, serving as the fourth impression on the print-making paper. Then, I cut a small hole in a piece of paper, and used it as a mask for printing the small central white "flame" shape. This served as the fifth impression on the print-making paper. 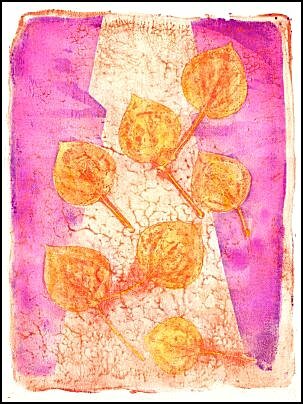 I inked the full gelatin plate with orange ink, placing the leaves facedown on the plate then lifted the exposed ink with newspaper, as described above. I then printed this gelatin plate as the first impression on the print-making paper. Then, using the Plexiglas technique described above to create the very light orange ridged texture, I printed it as the second impression on the print-making paper. Then, I taped pieces of paper in place on the print-making paper to serve as a mask over the leaves and the central angled shape. I then inked a gelatin plate with a thin layer of violet ink, and printed it as the third impression on the print-making paper. I then hand-colored the individual leaves with watercolor on the print-making paper. I cut a rectangular hole out of a piece of newspaper, placing it on a gelatin plate, then rolled yellow/orange ink on the gelatin plate. The only part of the gelatin plate which received ink is the rectangle. I then printed this gelatin plate as the first impression on the print-making paper. 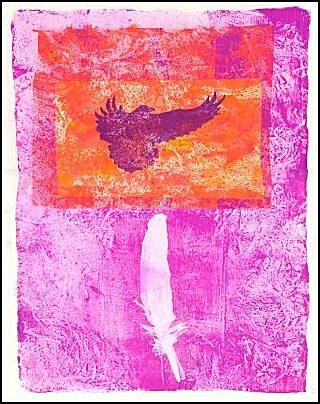 I then rolled violet ink on a gelatin plate, placed a rectangle of newspaper on the top of the plate as a mask (smaller than the yellow/orange rectangle), and a feather on the bottom of the plate, then printed this plate as the second impression on the print-making paper. 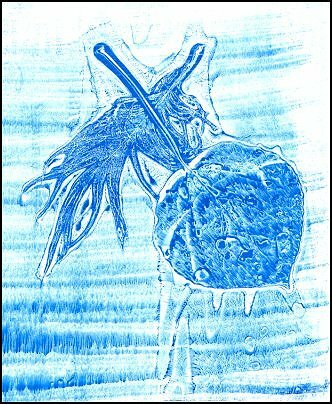 I then carved the bird image out of a rubber block with an X-Acto knife, inked the block, then printed it as the third impression on the print-making paper.